Sound It Out! lets beginning readers practice phoneme (letter sound) and grapheme (sound spelling) relationships by dragging and dropping letters to spell a word correctly. Students can choose from two game themes. Sounding out involves decoding, which is applying knowledge of letter-sound correspondence and patterns in order to pronounce words correctly. Decoding is a foundational skill needed to build phonics and reading fluency. Kindergarten and first grade students learn to decode words with simple patterns, like CVC words. From third grade on, students begin identifying word chunks to decode multisyllabic words. Some words are more difficult to sound out than others, due to irregular phonetic patterns. Kindergartners and first graders will then learn to build on their alphabetic knowledge to be able to decode and sound out simple CVC (consonant-vowel-consonant) words, like cat. As students move to higher grade levels, they will be exposed to increasingly complex phonetic patterns. 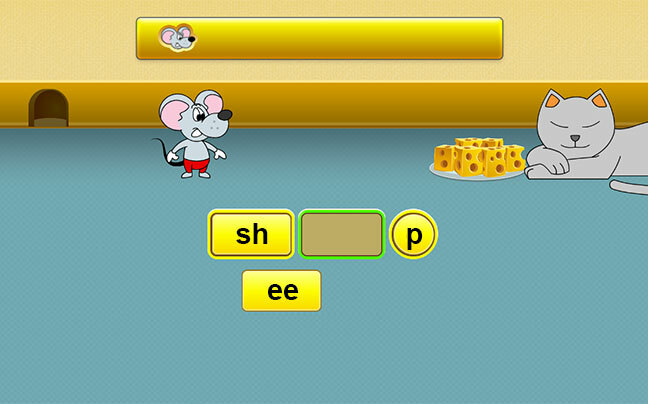 For example, first grade students will study vowel digraphs like /ow/. In 2nd grade, students will study silent letter patterns, like /kn/. Later, in upper elementary and middle school, students will be exposed to multisyllabic words and will chunk word parts, like prefixes and suffixes, to decode. Throughout K-12 English language arts, students will learn phonetic patterns in order to better sound out words and become fluent readers. How to teach: Often teachers assign weekly spelling words that follow a particular spelling pattern. Sound It Out! engages students in interactive spelling practice. The learning game can be used during literacy centers or part of homework, as independent work. A word is broken up by graphemes, just how words are broken up in an Elkonin box. When a student places the letter(s) in the wrong spot, immediate feedback is given. Students are given 1 to 5 attempts depending on the number of graphemes in the word. After using all attempts or after a correct response, the game will show students the correct way to sound out the word and will show the word in Elkonin boxes. Students who responded correctly can skip over the visual of the Elkonin boxes and the audio of the correct pronunciation. Students will continue to work on the game until they have tried to sound out all words on their word list. Teaching Tip: Sound it Out! can supplement K-8 phonics instruction during word study or homework. VocabularySpellingCity’s ready-made Words Their Way lists are a suitable choice for students K-12. Primary students can practice simple spelling patterns, like the silent e. Students in grades 3-5 can sound out more complex patterns, like final unstressed syllables, while students in grades 6-12 can benefit from Sound It Out! to decode multisyllabic words. English Language Learners (ELLs) can benefit from phonics practice using Sound It Out! because of the audio visual features. Sound It Out! can be effective with high frequency words, as they follow unusual phonetic patterns and are difficult to sound out. Also, avoid pairing the game with an abbreviations word list.